With the sunny hot weather due today the GSPCA are calling everyone to be mindful of your pets. Don't leave your dog alone in a car. With the sunny weather projected and the recent warm weather the GSPCA are calling everyone to be mindful of your pets. With the hot and sunny weather we are currently enjoying the GSPCA are calling everyone to be mindful of your pets. With a lovely warm and sunny day the GSPCA are calling everyone to be mindful of your pets. 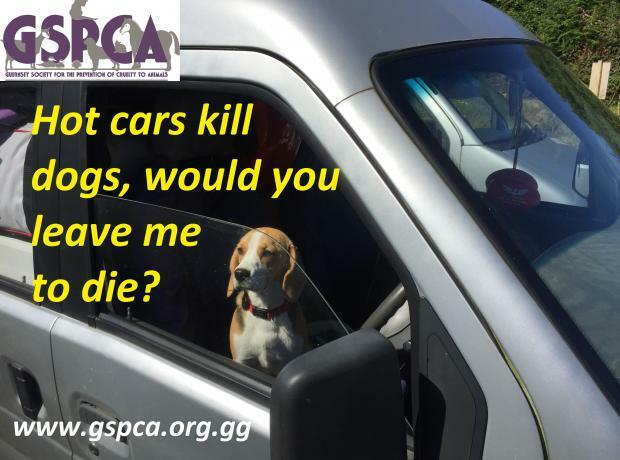 Today is the hottest day so far and the GSPCA are calling everyone to be mindful of your pets. The GSPCA Welfare and Education Officer Sarah Creasey who joined the team at the end of 2013 has just got back from spending two weeks training with the RSPCA in South and West Wales. Last Wednesday we had our second Volunteer Induction Evening which was even more popular than the first. With 24 in attendance and 18 wanting to sign up as volunteers the GSPCA welcomed the group into the family. From those wanting to help muck out to those wanting to fund raise they arrived and were welcomed at the Shelter before having a presentation and talk about the work we carry out as well as an Induction to enable them to work safely at the Shelter and during our events. On Saturday Roy Cochrane held a talk and slide show at Les Coutils about Guernsey Changes. Over 40 tickets were sold and all enjoyed a cream tea as well as a raffle. On Saturday the GSPCA received a very concerning call about a kitten that had been seen running off the harbour wall. Annabelle Janes Animal Care Assistant and Animal Collection Officer was dispatched to the scene in the GSPCA Ambulance on Saturday to the Harbour wall next to the Herm Kiosk. When Annabelle arrived at the scene the tide was low and the kitten which had apparently run straight out and over the wall had been seen crawling under a near by yacht.